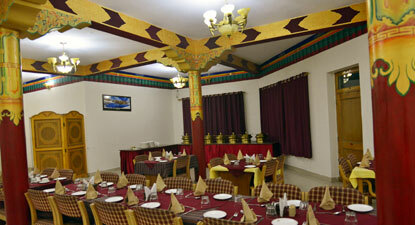 Hotel Mansarover is a centrally located A Category hotel in Leh. The hotel is situated in a peaceful surrounding in close proximity to the town centre. Airport Transportation, Doctor on Call, Family/Child Friendly, Parking, Room Service, Complimentary Newspapers in Lobby, Internet/Wi-Fi, Welcome Drinks, Backup Generator, Travel Counter. Bottled Water in Room, Complimentary Newspaper, Television Room, Luggage Rack, Shower Caps, Telephone, Dustbins, H/C Water, House Keeping, Complimentary Toiletries. User reviews for "Mansarover Hotel Leh"